This month, Sally has set the challenge for saffron buns for Fresh From The Oven. I do these challenges for myself, as it takes me out of my comfort zone of the usual bread I bake. On Saturday when I made the buns it was cold. Our weekends have not been particularly warm for what seems like forever. So, given that it was cold, I let my bread maker do the hard work for the dough for the saffron buns. I usually find the most suitable recipe in my bread maker book for the challenge, but this month I used Sally’s recipe as is and put everything in the bread maker in the correct order. The dough probably would have kneaded better in my kitchen aid, so I need to see how to just do the proving in my bread maker. As soon as I took the saffron buns out of the oven I recognized them as being similar to the rock buns we enjoyed as children. We ate the first two straight away, and then I left the others to get cold so that I could style a photograph. I never thought that those words would come out of my mouth. But, I am spending more time where ever possible styling my photographs. I am very inspired by my friend Sam and I try and think of her when I have my camera in front of me, as her photographs are amazing. Do go and take a look at her blog. Do you challenge yourself in the kitchen? Mmmmmm, those look good. Pass one this way! thanks Jacs, how are you? If they are like rock buns count me in! They look delicious, and you took m eright back to childhood with the mention of rock buns !!! I have never made anything with saffron, but I think I should start soon. This looks fantastic! 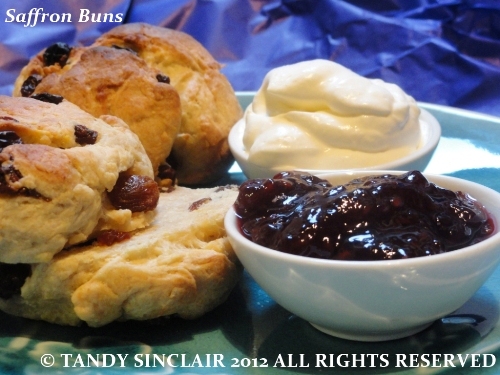 The buns look great, like the saffron and the currants in it…YUM! They look delicious, Tandy! Did they have a gorgeous golden crumb? These sounds delicious! You styling is pretty! I am so sorry for the iregular visits but between my MIL here, wqatching the Olympics and being down with a cold, I do not do anything else! I have often thought about getting a bread machine!! I need to start challenging myself with bread baking again…its been too long! Loving these rolls! Lovely recipe Tandy and lovely photo. Bravo for making these Tandy – I’m so delighted you did. Rock buns were very different to this in my childhood – we should swap recipes here. Gorgeous pic too. I like the sound of saffron buns.